May 15th, 2013 - Toronto It's springtime and we are proud to let the sun shine on our next release of Media Factory! There are few new features, but the best is yet to come in another announcement coming soon! Media Factory is now an essential tool for anyone looking to use Instagram for audience engagement with the addition of our Social Feeds module. 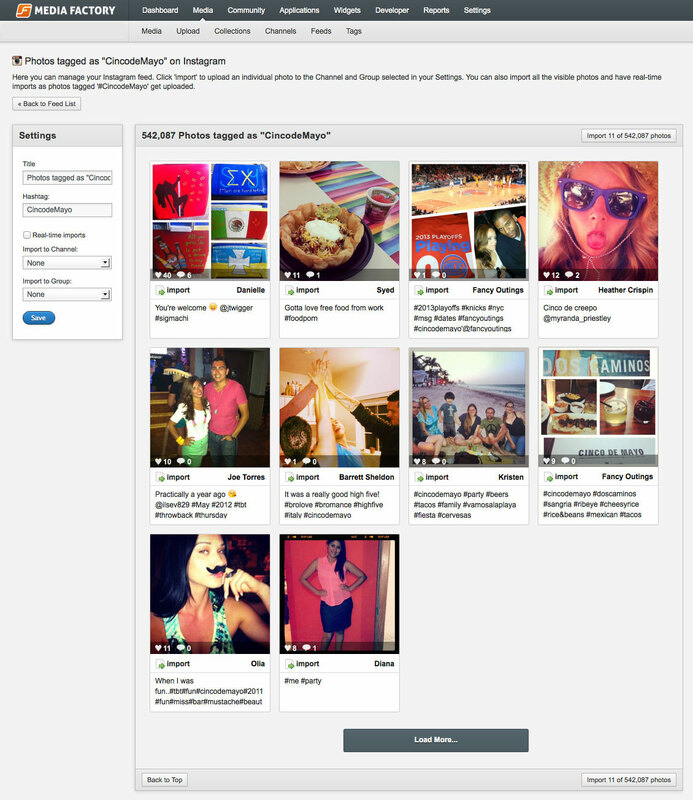 Create a unique hashtag and run a contest, or simply browse Instagram for the best pictures representing any subject. All Instagram content uses the same moderation and curation workflows as content uploaded directly by your users. If you wish to have this feature activated in your account, please contact your account manager or call the hotline at (866) 779-9215. 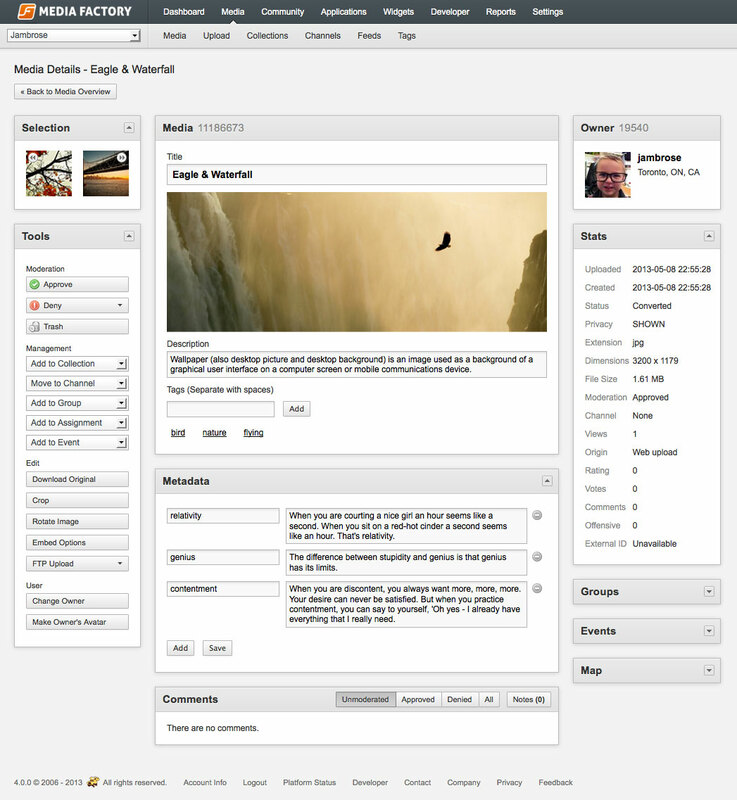 We've made a few changes to the Media Detail page based on user feedback. Most notably is that media metadata is now found, legible, below the media in the main column. Tags are also moved from the sidebar to under the media. This should make reviewing and moderating extra information submitted by users much easier. One of the new core features of Media Factory 4 is assignments. Assignments are a type of group that are associated with specific tasks performed by users such as submitting photos of a particular news event or general calls-to-action such as prompts for cat photos. As part of this project, we consolidated groups and events into the same system and redesigned the group detail page into sections to simplify the user experience. We've added deep support for game mechanics using the Gigya Gamification Platform as a backend. Any action taken by users on the Media Factory platform can be tracked and rewarded. Emails are sent to users whenever they earn an achievement or progress to a new level. Updated profiles include badges, point totals and customizable levels. This is not currently a self-serve product, so please contact your Filemobile account representative to get started. For the full list of fixes and enhancements, visit the Developer Portal!